I wasn’t planning on doing another post today, but this song just came on the radio and in light of the series I did this week, stood out a little more than usual. It seemed fitting for me to post it. To a needy soul but don’t have love then who is poor? What are we saying, doing and writing that others might copy? This familiar passage spoke something new to me this morning. Sometimes, the acts we feel led to do for the Lord do not make sense to others around us. Perhaps we choose to fast at an “inopportune” time. Maybe we worked in the nursery 4 Sundays in a row, while others had the opportunity to worship in service. It could be that we chose to drive far out of our way to stop by and visit someone who needed to see a friendly face. The examples could go on and on, but the principle remains. Not everything we personally choose to do for the Lord will viewed in a beautiful light by others around us. We may even be criticized for our sacrifice. Not everything we do has to meet with the standards of others…even if they are fellow followers. If we feel a nudging to do a work in the Lord’s name, then we are pleasing the only One who matters. Keep on, friend. You are pleasing the One who is worth the sacrifice, and that is truly all that matters. While we wait on the Lord’s return we have work to do. We can never forget that ultimately, the work we are called to do is to spread the message of Jesus Christ. God is depending on us to point others to Him. I was reading the parable of the talents in Mathew 25 this morning. It reminded me that God has entrusted us with resources that He expects us to use to multiply the kingdom. He did not give us resources and salvation so that we can sit comfortably in our happy place and keep it all to ourselves. He expects us to put those resources to work. That work will look different in a lot of lives. We have all been given different resources so that we can reach a wide range of people. Some will be preachers and pastors. Some will be missionaries in a foreign land. Others will minister to people in prison. Levites will lead the way with music ministry, bringing others into the presence of the Lord. Others, however, may look more like a mother talking to her children about the Lord day after day, reminding them of God’s love and provision. Some will hand out food in their community, or spread God’s love to those around them by simple actions of kindness or charity. I have watched my own mother approach a cash register to simply purchase a shirt, and before we walked away, both she and the cashier were in tears, hugging and praising God. It could look like that. Perhaps it’s a Sunday school teacher, faithfully teaching Sunday after Sunday, feeding adults or children with the Word of God. It could be a nursery worker, caring lovingly for a helpless baby while it’s parents are being ministered to. Sometimes it’s a miraculous offering of forgiveness that can only be explained as a gift from God. It could even be a financial giving of resources. God expects us to use our resources for His kingdom. In the parable of the talents, the man who had given the talents to his servants returned to find out what had been done with them. There was 1 servant who had buried and hid his talent until the master returned. The master was disappointed that the servant had not done anything with it. One day, Jesus will return. He will look to see how we have used our resources for His kingdom, and He will expect to see some sort of return. We cannot hide our resources or His love away. Others are counting on us. And our work will please the Master. The song of a Carolina Wren caught my attention this morning. I found it was perched on my fence, singing. I noticed a rustling in the garden below and realized that it’s mate was down there eating. I watched as they took turns perching and eating. It was nice to see the unity between the birds. After that, I read the parable of the lost sheep, and I couldn’t help but see the way God shows us His feelings throughout His creation. Mt. 18:12 says that if one sheep is lost it will be sought. Every single one of us is important to God. When we think of the way we feel about our own family, we can understand why this is important to God. If one of our own family becomes separated from us, we would give anything to bring them back to us. The birds I was watching this morning were in sync, so beautifully paired, that I know they’re union has meaning to them. God put examples of His own feelings within His creation. We can better understand that God truly doesn’t want to lose a single one of us. He wants us all with Him. We are important to Him and it grieves Him to lose us, just as it grieves us to lose someone. If we know someone’s family member is missing, we do everything in our power to help them find that person. God asked us to do the same with His children. When one strays away, or one hasn’t found the way to Him, He asks us to show them the way. He asks us to introduce them to the One who is the Way, Jesus Christ. We can take a lesson from God’s creation and lovingly seek out God’s lost children and bring them to Him. Lord, help us show them the Way. Help us to get over the fear of speaking to others about You. Help us to remember that the love we have for our own family is just a glimmer of the love You have for Your own children. Help us to be willing to seek and find those who are lost. We know this is Your will. Thank You for loving each one of us this much, Lord. You are a good Father. Our place is at Christ’s feet. If we can get that right, the wisdom and learning will come. When we are speaking to others about Christ, it will be the combination of old lessons we’ve experienced and new observations we are daily experiencing that will bring it all together. Every day we learn more about Christ, and sometimes those things enlighten us to the older things we’ve already gone through or learned. It all adds to what we know. Even those old lessons we learned that we’d rather not share, can help bring credibility to what we say. If we’ve been through something and learned more about Christ through it, perhaps that will be the thing that will most connect with the person with whom we are speaking. Perhaps telling someone that God’s yoke is easy and His burden is light is best said when you share about a time when you found out the hard way just how heavy the burden of sin became for you. Perhaps the childhood verse you learned about hiding God’s word in your heart means so much more when you read Mt. 13:52 that says a scribe is the one who brings out old treasures to combine with the new. We bring out of the treasure of our knowledge of Christ something to share with others. Spending time with Christ is what gives us something to share. The Lord revealed something to me yesterday as I was driving. There are signs, arrows, and directional markers all around us. Some signs to tell us exactly which driving lane we need to be in. Arrows point us in the right direction on one-way streets. There are signs to let us know what’s ahead, when to merge, if there is a detour, and on and on. 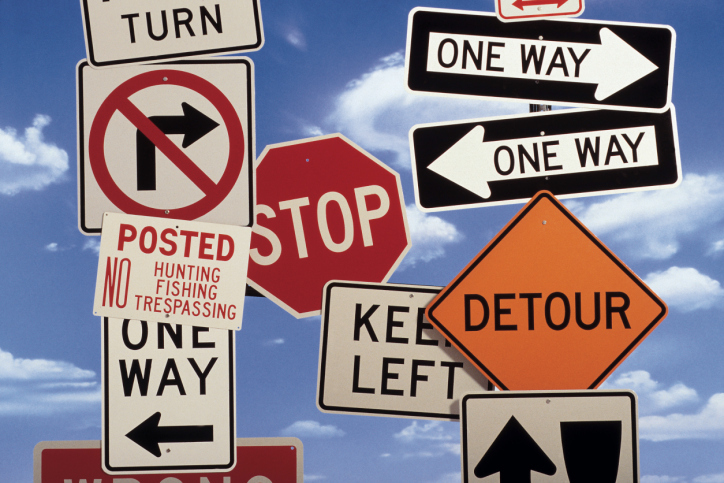 We are surrounded by instructions, and yet some people are still ‘directionally challenged.’ Why is that? They have good intentions. They know where they want to end up; however, the get flustered in the details and lose their way. This proverb says that even though the fool is looking for wisdom, he cannot see her, though she is right in front of him. Not everyone can clearly see the signs and markers. Not everyone can figure out which lane is correct when there is so much going on around them. Driving (like life) is so busy sometimes, and we cannot always see the little arrows in the midst of the noisy crowds. Sometimes the little details can be hard to pick out among all the hundreds of signs, directions, and choices all around us. This could be a lesson about how we shouldn’t overlook the wisdom that is right in front of us. This morning; however, my heart is aching for those are can’t find their way. The word fool has a condescending meaning in our times; however, God uses the word fool to mean someone who is disregarding His Word. It is someone who has become lost on their journey. Sure, there are signs, markers, arrows, and indicators all around them, but they cannot see them in their search for answers. Instead of us having ‘road rage’ against those around us who are lost or disregarding God’s Word, we must allow compassion for their souls to cause us to be someone who lovingly points them in the right direction. Do we want those around us to drive off the cliff into tribulation, fiery death, or torment? I don’t want anyone to end up in a location of pain and anguish that was designed for their enemy just because they missed the U-turn sign. When we’re driving as a group and someone doesn’t make it through the light or misses the turn, do we continue on, leaving them behind? No. We stop and wait for them. Perhaps we go back to get them and guide them on. The journey to eternity is of far greater importance than a trip to the store or to that vacation spot. We can’t let ‘road rage’ cause us to laugh at, judge, or scoff at those who are losing our way. We MUST stop and help! Someone else showed us the way. We have to share the secret with someone else.